To put it simply, the Concordia Stingers men’s basketball team is hot right now. Winners of their previous four games, the Stingers made it five in a row on Thursday night when they defeated the Bishop’s Gaiters 72-53 at home in the Concordia Gymnasium. 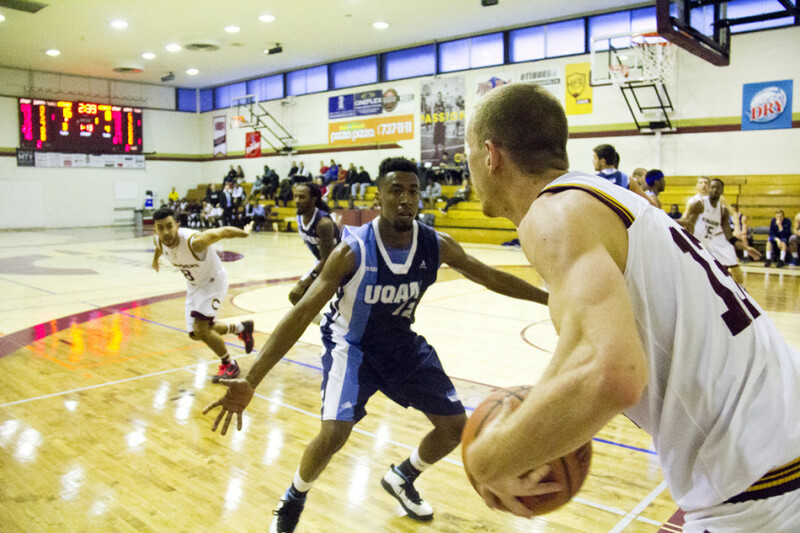 Stingers forward Michael Fosu led all scorers with 22 points and added 10 rebounds. He also hit four of his six shots from three-point range. Guard Jaleel Webb added 16 points of his own for the Stingers, while Abdul Kamane led the Gaiters offence with 13 points. The first quarter was a tight and defensive one and it showed on the scoreboard. After the first 10 minutes, it was only 12-8 and would be the game’s lowest scoring quarter by quite some margin. As time ticked down, both teams struggled to find their shooting stroke as continuous attempts clanked off the rim and backboard. The second quarter was the complete opposite. Fast breaks, turnovers, and a high tempo were the main themes as Concordia sank 24 points to Bishop’s 19. The Stingers would head into half with a 36-27 lead and the next 20 minutes promised to excite the crowd at the Concordia Gymnasium. The third quarter turned into a bit of a slam-dunk competition between Concordia guard and forward Ken Beaulieu and himself. The six-foot four Longueuil native had a monstrous put-back dunk on a missed shot to send shockwaves through the gym. Less than two minutes after, he slammed down a second via a sweet alley-oop pass. On the off chance anyone in the building had any lasting doubts, Beaulieu made a third dunk with the same authority and ferocity that has given him his reputation as one of the more exciting players of the Réseau du Sport Étudiant du Québec conference. Despite all the excitement, Bishop’s began to claw their way back at the end of the quarter. A newfound resurgence and some scrappy defense saw the Gaiters steal back a few points and start cutting into the lead. The 6’6” guard received a pass at the top of the arc and buried one at the buzzer to steal all the momentum back for Concordia and revive the home crowd. The fourth quarter would proceed and Concordia outscored their opponents 16-13 and saw out the game. It finished at 72-53. Even in the recent spell of good form for the Stingers, Popovic knows there is still a lot of work to be done if the team wants to achieve anything of note at the end of the year. One glaring aspect is turning the ball over too much. Concordia currently sits tied for first place with McGill. Both teams have a 7-4 record. While the win streak is still alive and morale in the locker room is high, Popovic and his team know they haven’t won anything yet. The Stingers will try to make it six in a row on Saturday night when they visit Bishop’s for a game at 8 p.m.